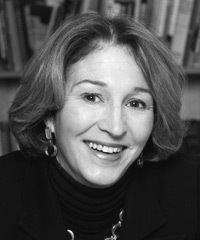 From 2009–2011, Anne-Marie Slaughter served as Director of Policy Planning for the U.S. Department of State, the first woman to hold that position. She received the Secretary’s Distinguished Service Award for her work leading the Quadrennial Diplomacy and Development Review, as well as a Meritorious Honor Award from the U.S. Agency for International Development (USAID) and a Joint Civilian Service Commendation Award from the Supreme Allied Commander for Europe. Prior to her government service, Slaughter was the Dean of Princeton’s Woodrow Wilson School of Public and International Affairs from 2002–2009, where she rebuilt the School’s international relations faculty and created a number of new centers and programs. Slaughter is a frequent contributor to both mainstream and new media, publishing op-eds in major newspapers, magazines and blogs around the world and curating foreign policy news for over 35,000 followers on Twitter.